The spot offers the rustic flavors of the Abruzzi and Calabria regions of Italy. Often it’s all in the delivery. 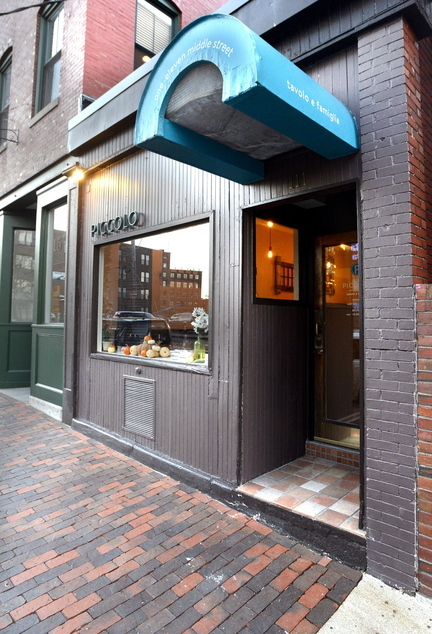 BOTTOM LINE: For authentic southern Italian cooking, elegantly and simply prepared, Piccolo offers an outstanding dining experience in a small, casual café setting. The wine list offers serious bottlings from Italy’s outstanding wine-producing regions; the list is well-priced. The menu changes daily, but best dishes include any of the pastas, pork, lamb and fish preparations. When available, the slow-baked fish with potatoes cooked in whey is a standout, as is the brined sardines and cavatelli with lamb ragu. Desserts are made by pastry chef and co-proprietor Ilma Lopez. Ratings follow this scale and take into consideration food, atmosphere, service and value: * Poor ** Fair *** Good ****Excellent ***** Extraordinary. The Maine Sunday Telegram visits an establishment twice if the first dining experience was unsatisfactory. The reviewer dines anonymously. After many visits I’m impelled to proclaim that Piccolo is the best of the new breed of dining establishment to have opened here this year. It’s not chic or outwardly trendy, but, rather, it is seriously good. Sansonetti slipped into Maine a year ago on the heels of a highly successful career in New York, where he was the executive chef of Bar Boulud – part of the Daniel Boulud empire of international dining establishments. When Sansonetti arrived in Portland, his wife, Ilma Lopez – also a Boulud alumnus – was already working as the pastry chef at Portland’s Grace Restaurant. Their plan was to open a fine-dining establishment together – two pros aligned to give our city an exciting dining venue. Along the way he was consulted to tweak the menu at Taco Escobar and then opened his instant-hit, unique sandwich shop, the Blue Rooster Food Co. on Dana Street. The little shop-front that is now the home of Piccolo (formerly Bresca) sits discreetly along the streetscape. Knee deep in the Old Port, it’s on the stretch of Middle Street where the surrounding architecture isn’t as impressive as the row of 19th-century buildings preceding it. Inside the décor is simple, revealing a Lilliputian dining room that accommodates only 20 diners. The wait staff is efficient and very informed about the menu. Nearly everything that comes out of the kitchen is house-made or expressly imported from Italy, and the staff does a thorough job of explaining every detail. 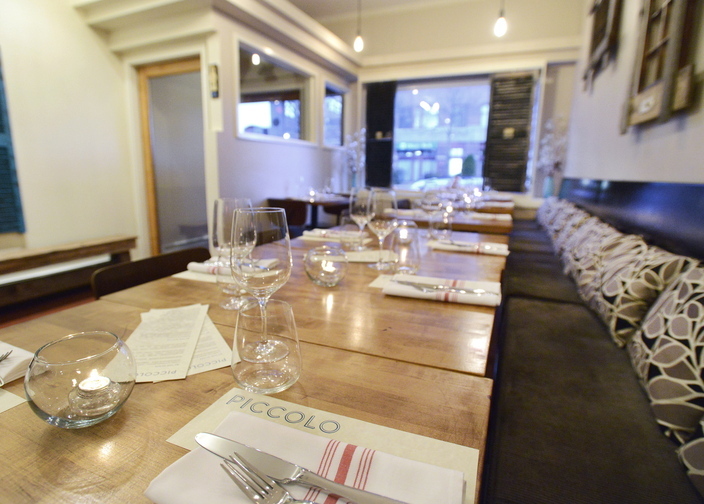 Piccolo is not a kitchen of old-school red-sauce Italian-American cooking. Instead Sansonetti presents a meticulous interpretation of the cuisines of southern Italy – namely, the rustic flavors of the Abruzzi and Calabria regions. It takes a discerning palate, however, to appreciate his food. The cooking won’t knock you over like downing a head of garlic. And for some this restrained style is fleeting. For the more astute, however, the sum of the ingredients – so subtle and refined – evokes an inspirational web of flavor. During my many visits certain dishes were surefire standouts. I loved the little “snack” called pane carasu – house-made ricotta ($7) to accompany the addictive homemade cracker-like bread. Another starter dish not to miss is the melanzane ($10) – roasted eggplant with oregano and smoked ricotta. Some of the main courses that I’ve tried with guests in tow included a dish called Del Mar ($24), an incredible preparation of slow-baked fish (hake or other local white fish), served with potatoes cooked in whey, a process that renders these into the creamiest morsels; the dish is further harmonized by a judicious mélange of pine nuts, capers and tomatoes. Another notable preparation that one guest deemed “perfection” was porcellino ($25) – meltingly tender, local milk-fed pork with Swiss chard, heirloom garlic and Marsala, an ambrosial preparation of impeccable texture and flavor. On another occasion I went solo to dine at the bar to enjoy a simple meal of two incredible preparations: sarde scapece (brined sardines, $11) followed by cavatelli (pasta fatta casa, $23) with lamb-neck ragu. The sardines were cured in red-wine vinegar, saffron (from Abruzzi), sea salt, sugar, mustard seeds, Calabria chili and Sicilian oregano. Extraordinary! As for the pasta, the hand-rolled cavatelli is lightly sauced with an earthy lamb ragu, topped with eggplant, orange and pecorino. What ultimately set the standard for me of Sansonetti’s abilities as a chef unfolded at the first of his Sunday suppers, which I went to a few weeks ago. It’s a five-course prix fixe dinner ($49) with a menu that is entirely up to the chef. You have the option, however, to alert the kitchen to personal preferences. Without notice to the restaurant – to maintain some degree of anonymity – we arrived without a reservation to dine at the bar. It was then that I informed our waitress that my dinner guest was a strict vegan. Could the kitchen, I asked, accommodate on such short notice? My own requirements were easy. I eat everything! On the spot Sansonetti devised two brilliant meals. With it we opted for the wine pairing for each course. This added another $50 to the tab per person, but it was well worth it. Two of my favorite pairings included the Tenuta Ronci Argento, Chardonnay, 2012, and the Martilde Barbera, 2011. The vegan menu began with crostini of chickpeas followed by roasted local delicata squash. The pasta course of Abruzzi-style buccatini (house-made) with roasted cauliflower arrabbiatta (a spicy blend of tomatoes and olive oil) and a selection of assorted olives came out next. The dessert was a Lambrusco jelly and red wine honey with fennel. It was an amazing meal rendering my vegan friend blissfully sated. My heartier feast began with crostini topped with lamb kidneys, speckled with bits of heirloom beans and Italian blood sausage. This was followed by a felicitous fish course of olive oil-poached swordfish belly that was exceedingly delicate. A mesmeric pasta course – so light it nearly levitated off the plate – was gnocchi mixed with pork blood and braised pork belly, orange zest, red peppers and house-made lardo. A cheese course concluded the savory offerings. Dessert was an intense bittersweet ricotta cake with roasted hazelnuts and chocolate cream. The range of dishes and the ease with which the kitchen could put out such a complex, extemporaneously prepared dinner could only have occurred from a chef who knows exactly what he’s doing.